Almost all of my furniture is a mix of antiques, reproductions, and various pieces that have been found and re-habbed. Not only do I love the uniqueness this provides for my home as well as it's cost-effectiveness, but there are always those items for the modern household where it is a bit more difficult to achieve. For example, it is a challenge finding an antique queen bed. They just didn't have beds that big back then... Media centers are another example. You wouldn't find anyone sitting around fifty years ago watching big flat-screen TV's with DVR's, Blu-Rays, Wii consoles, or satelitte boxes attached to them. This poses a challenge for all of us out there who desire a unique, stylish way to house our televisions and all their trappings without paying an arm and a leg. Since the TV hookups were on an adjacent wall to the fireplace, it meant setting up a room with "dual focal points"....if there is such a thing. When my husband and I were moving our antique carved sideboard into the house, it dawned on me to move it into the great room instead of the dining room where we've had it for the last several years. We previously had the TV on another antique sideboard, but with tall legs, I could always see the cords and it bugged me! The viewing height was just right and when I found the antique brackets, I knew I could pull off some kind of media unit. 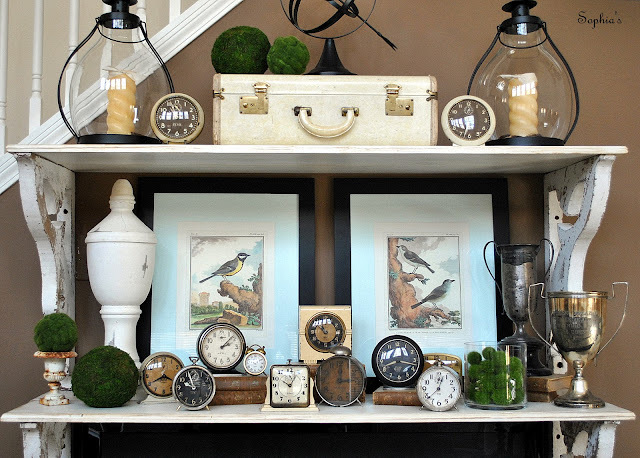 I initially envisioned my large collection of antique clocks here, but I ended up just putting a few out. I suspect I'll be playing around with these shelves quite a bit...changing, re-arranging constantly like I always do! And do you know what the best part of the project was? It only came in around $100! Wow!! I love what you did here. This gorgeous unit gives you so much storage and so many options for accessorizing. 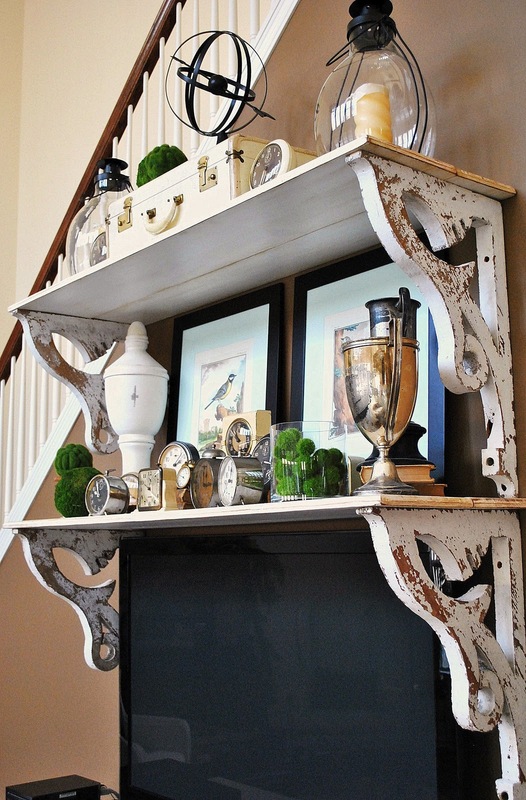 Those antique brackets are perfect. WOW now that's one gorgeous media console! LOVE the shelves above it too!! OH my goodness... looks fabulous! Your a wonderful decorator!!!! 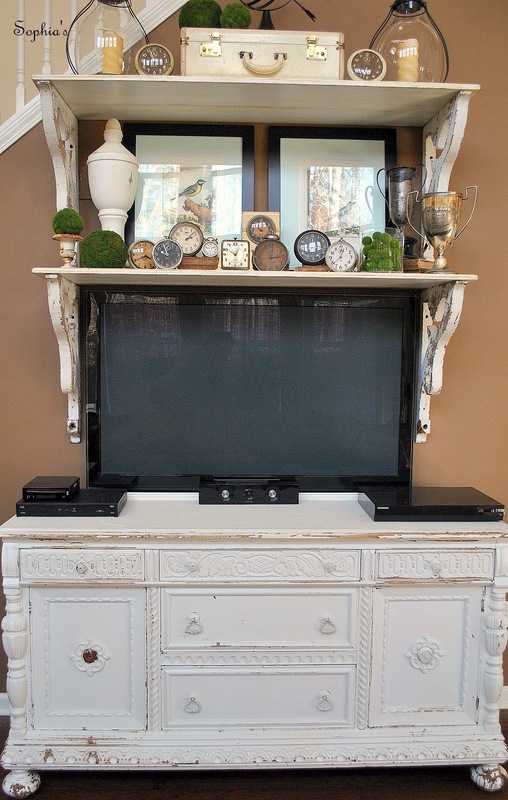 I love this console and I love how you've used shelves to create the whole look. 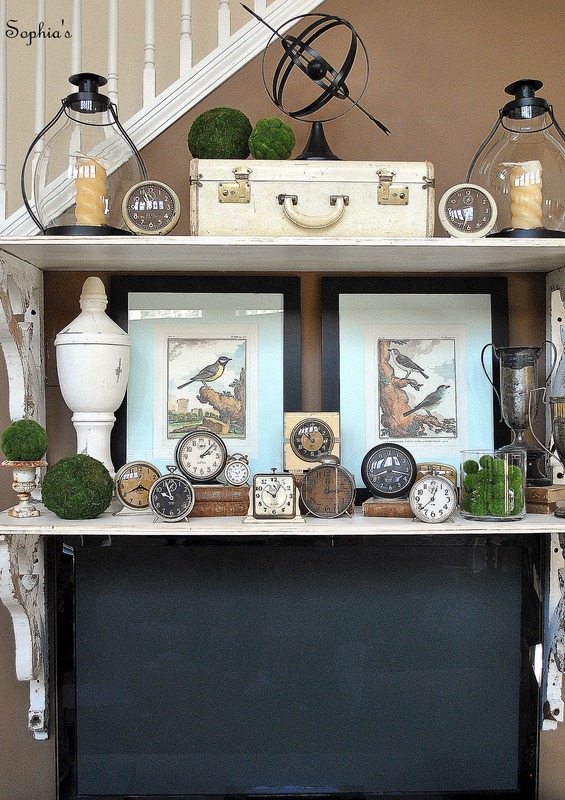 I'm a bit of a clock fanatic so I have to comment on how awesome your collection is! WOW!!! I love it. You sure do have the knack of putting the right things together to come up with an amazing look. Have to say - love those brackets...now where did you get those beauties? It's beautiful! I love your collection of clocks, they add to your room! Looks great! This is wonderful! I love the rustic and homey look it gives your huge TV! I need to convince my hubby to let me do this too! 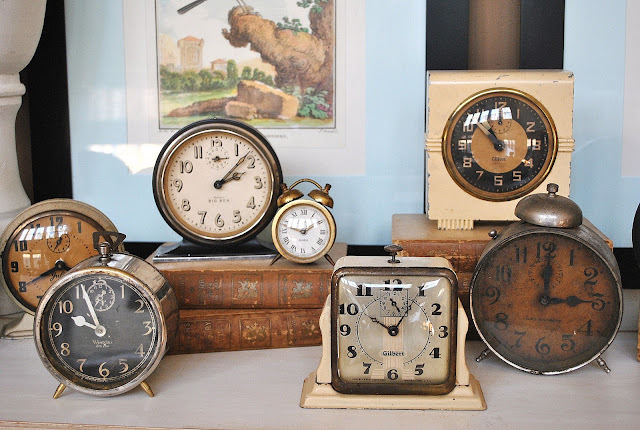 BTW, the collection of clocks is adorable. I truly LOVE this! We are fixing to buy a flatscreen and I have been looking for a buffet or dresser to place it on. Yours is perfect and I LOVE the shelves! 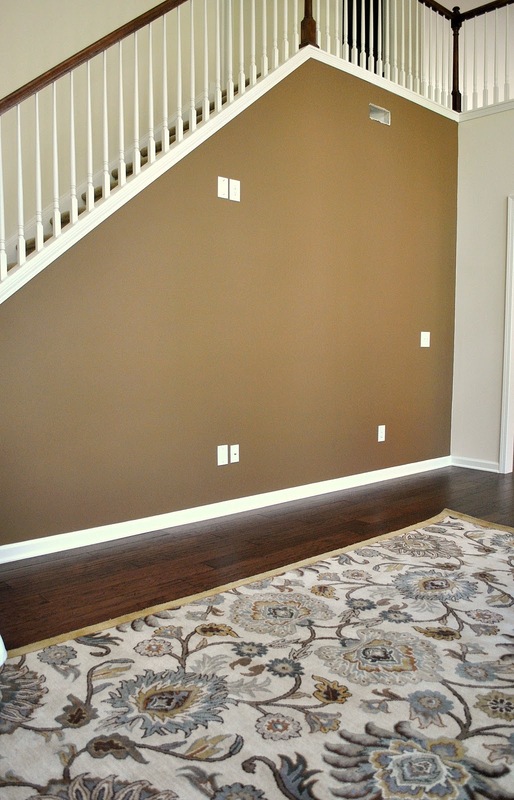 Oh girl, I LOVE everything about that whole room, but your entertainment center blew me away, and I already knew you were creative and talented!! It. rocks. seriously. =) You've got STYLE!!! What a creative and fabulous idea! Your living room is beautiful too. Thank you for linking to the Open House party and I am off to browse your archives. LOVE those shelves and ALL the stuff on them. Love this idea! Looks beautiful! Found you via Alison @ Stuff and Nonsense FB post! This looks super! What a great looking unit! Thank you for linking this lovely post to Potpourri Friday! very clever and creative and so great looking! That looks awesome. I love your clock collection. Now you have created a very unique media cabinet, love the shelf brackets really add a lot of charm. So very creative, and love how you group things together. 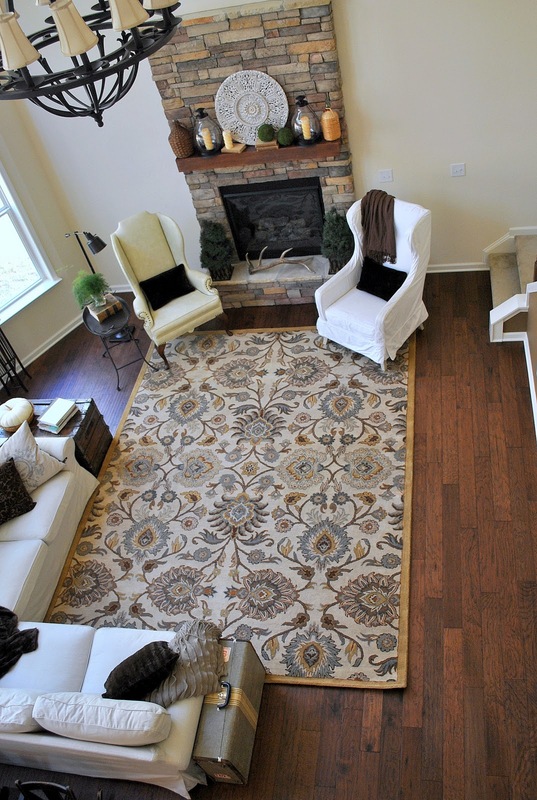 Your living room is gorgeous! Thanks for sharing your treasures at Sunday's Best! wow- that is gorgeous! the chippy finish is stunning with all those details, and hello those shelves frame out the tv beautifully! Very impressive! Funny thing is, I've been trying to create my own version of an entertainment center and was considering adding shelves above the t.v. Now I have a beautiful source of inspiration to pull from. Thanks for sharing. Clever and beautiful. I love it! So awesome! Thank you for joining me at Home Sweet Home! This is increadible! I love the console it's gorgeous and the shelves above really pull it all together! Wonderful job! Thanks for sharing and linking up. What an incredibly clever idea! It looks amazing! This is just beyond amazing! I LOVE It to pieces and it make she want to get rid of our big ol armoire! So glad I stumbled upon your blog this evening. I am your newest follower.